Fall break. Before our blog will go on a two week hiatus, I wanted to share some ideas with you on the team it takes to get a clinical exome analyzed – my impression is that you need at least different five people to translate genomics into patient care. 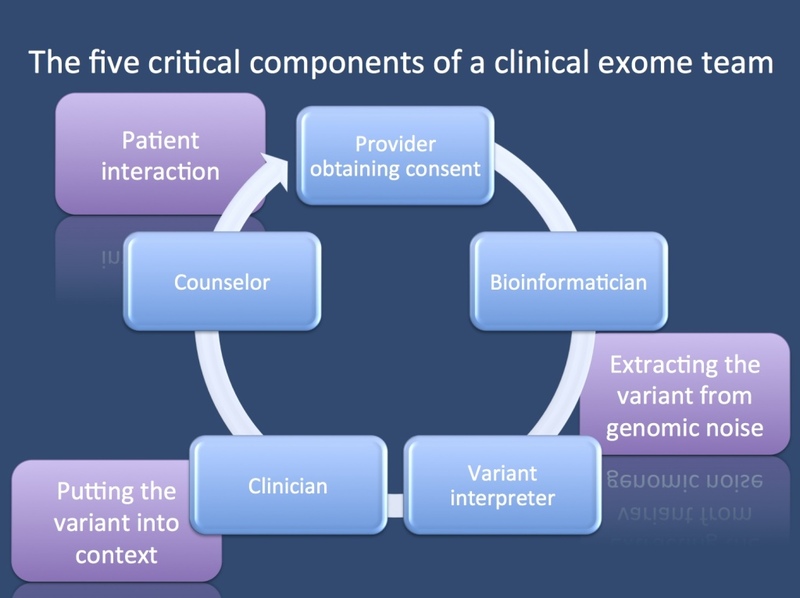 The five components of a clinical exome team. Provider obtaining consent. Exomes start with getting informed consent. An exome is a diagnostic procedure that is a bit different than other methods in biomedicine. It will identify changes if they are obvious, but depending on the level of scrutiny or the threshold of calling variants pathogenic, there will be many variants that might be disease-relevant. In up to 10% of individuals, there are secondary medically actionable findings that might be worthwhile reporting back. There is no single correct way of consenting a patient for exomes or genomes. Different institutions and organizations have tried to come up with suggestions, including formats that require a disclosure of all possible diseases that may be identified. With the amount of genetic testing increasing quickly, a full-blown two hour informed consent session may become impractical. Understanding that consent is a process, not a signature, your exome team needs a counselor or clinician who finds the right balance tailored to your patient and the question you’re asking. Bioinformatician. I’ll skip the DNA extraction and technical aspects of next-gen sequencing and wet-lab. Although equally important, these steps have become pretty routine. The next critical part of your exome analysis journey is having a bioinformatics person who cares. You might want to have an expert who guides you through the entire pipeline starting with alignment, variant calling, and functional annotation. Your expert ideally plays around and improves the tools at his or her disposal and has access to comprehensive and rich variant databases. Variant interpreter. This job has become quite distinct from the bioinformatics part and will probably become its only little niche. The variant interpreter takes a list of variants coming out of bioinformatics and checks them for their relevance to the disease in question. The interpreter then usually puts together a summary of the possible candidates, reviews current literature, and assesses the functional annotation. Some lines of evidence that a variant interpreter might consider include whether other pathogenic variants been reported in the same domain, how much we know about this gene, allele frequency in healthy populations such as ESP or 1000 Genomes, in silico prediction models, amino acid conservation, cosegregation within the family, etc. Clinician. Then the information goes back to the clinician who interprets the finding in the context of the patient’s precise phenotype. Does the variant fit with the phenotype, and does it maybe even tell us something with regards to patient treatment that we may want to change? Again, for patients with severe epilepsies, we expect that one out of three patients will have potentially explanatory genetic findings – in 10% of all patients, we expect this finding to alter management in addition to providing information about the genetic basis of the disease. Genetic Counselor. Knowing your patient’s disease and considering new treatment options is not enough – your patient needs to understand what you found, how you got there, and what it means. Even more, you have to make sure that the information is given back to the family in a way that the family can understand. This is nothing to do on the fly or at the end of an outpatient session. It usually helps if a dedicated counseling session is scheduled for this to make sure that it occurs in an appropriate context. Many countries have trained genetic counselors dedicated to this task. A constant interaction. I have displayed the five components as a pipeline, but in reality, it’s a network of interaction between the team members, and everybody needs to interact to make sure that no information is left behind. We will see exome conferences emerging in the same way that the advent of MRI brought us neuroradiology conferences. Disclaimer. The blog will have a brief two week hiatus, since I’ll be busy on the ward and studying for an exam. We’ll start again when writing about the Precision Medicine Workshop at Half Moon Bay at the end of September. This entry was posted in 2014, Bioethics, Bioinformatics, Epilepsiome, Epileptic encephalopathy, ILAE Genetics Commission and tagged 30-10 rule, acmg, BAM, bioinformatics, counseling, data return, epileptic encephalopathy, GATK, genetic counselor, informed consent, phenotype, secondary findings. Bookmark the permalink.